What a sweet custom sign that is! I'm sure she'll love it! Thinking I may jump in to this round of Alphabe-Thursday :D .
I love them all! Last week I saw the one you made for Brenda - I'll email you about that. Very inpressive. You are quite talented. Love the first one. Your Granddaughter is special to you I can tell! I like the first one too. 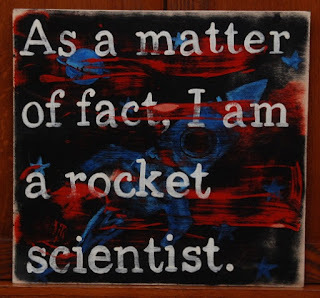 When I worked at NASA I worked with some Rocket Engineers. My specialties were Spacecraft Simulation, Environmental Sysetmes Control, and Electrical Powere Control. Oh Jenny! Very creative!! I've not painted is ever so long. I wish I had a bottle of time that I could add a few hours to certain days. Than maybe I would dabble again and paint and draw!! Always something to look forward to though. Nicely done Jenny,,, keep it up! I love the sign for your little one. What a precious gift that is! You just keep getting better and better! love them all, especially the cherries! Again ! such creativity ! Love your signs!!! 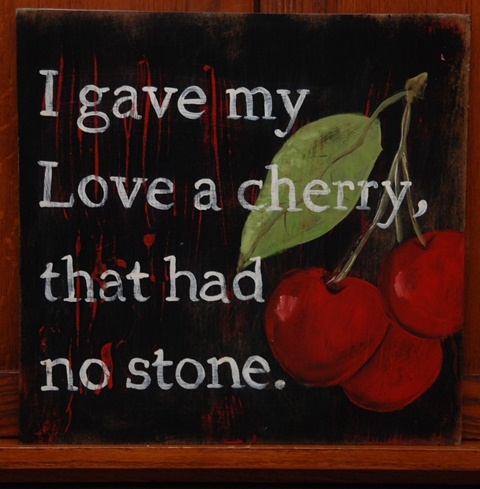 And how sweet is the cherry one for your grandlittle! Hi Jenny! I love your signs! You are a talented artist! Hope the holiday was a good one for you and yours. I was early putting my A post up! LOL! Have a good week! Oh I think your painted alphabe series are just amazing and wonderful. They are quite unique and beautiful. I like your cherry sign -- a wonderful old folk song! This is my first time participating in Alphabe, and I'm still working out the scope of my alphabet. aawww...the sign for your grandlittle is so sweet! I bet there's a plethora of signs you could paint. It will be fun to see what you come up with.